First off, maybe I should start by saying one of my 2013 list/resolutions/goals whatever you want to call them is to be some what “chemical free” by the end of 2013. Technically you can not be completely “chemical free” because baking soda(sodium bicarbonate) and Vinegar(acetic acid and water) are chemicals. Hell even salt(sodium chloride) is a chemical, although most people would not consider this harsh, unless you are consuming way to much of it. But you can definitely strive to be “harsh chemical free” to the foods we eat to the beauty products we buy. My goal is to stop using commercial shampoo/conditioners, face wash, lotions, hair dyes, traditional deodorant, hairsprays and lotions/creams. 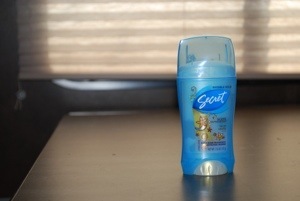 I have stopped using traditional deodorant for about a month and finally have found something that works for me. 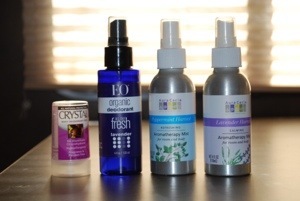 (I think you could ask any of my friends and they would/should say I smelled wonderful or at least I hope) I currently use a crystal rock salt that I wet before applying and than follow up with a peppermint or lavender spray. No aluminum, which some researchers have linked to breast cancer. I have completely stopped using commercial shamPOOS and conditioners as of a week ago. I have a friend in Kansas that told me if I stop showering and grow out dreads, she will no longer be my friend. Well I am still going to shower, just not shamPOOing in the traditional sense. So far I am on day 7 of not using commerical shampoo. 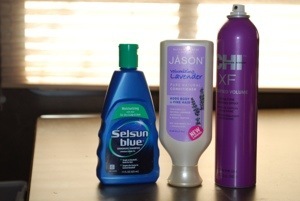 Other items I am using for my wavy/frizzy curls. Apricot Oil and water. Here is the blog where I have found the best recipe and instructions. No need to reinvent the wheel. She has has some great FAQs about No Pooing. 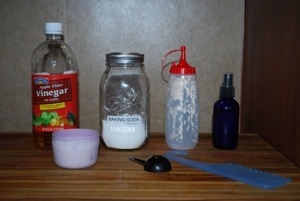 Day 1 note to blog-mixed together a tablespoon of baking soda and enough water to make a paste. My suggestion is to add just a bit of water at first and than add more later. I made the mistake and used way to much water the first time and it ended up looking like milk instead of a paste. Rub the paste into your scalp like a circular motion and let it sit there for a minute. It left my hair feeling “chalky” but clean. I followed up with the vinegar rinse and I only put it on it on the ends of my hair. Rinsed everything out, combed my hair and let it air dry. Weird….I thought I would walk around with a pickle factory smell, but once my hair was dry, no more smell. Day 2 note to blog- my hair feels really weird and kind of itches. Anyone that knows me intimately knows that I have struggled with dandruff since the birth of my daughter. My hormones have been jacked. So the itching thing makes me think that my dandruff may come back again. I have read some troubleshooting about No Poo and it looks like I used to much baking soda. Day 3 note to blog-Head really itches, so I decided to mix up some more vinegar and water and squirt that on my hair and rinse. Seems to be helping with the itch. Note to self Vinegar really burns your eyes. Day 5 note to blog- mixed up another batch of baking soda paste and vinegar/water rinse. I used way less baking soda this time. Day 6 note to blog- Hair feels frizzy, dry but does not itch. Just got my hair wet today. Day 7 note to blog- Did another round of vinegar/water rinse on my hair in the shower. Still got some in my eyes and it burned. The deodorant I was using. This is what I use now for deodorant. If you would like to find out more, comment below, send an email to roadmaptonomad@gmail.com, or send a singing telegraph. Also if you haven’t yet, go hit that subscribe button or “like” me on Facebook. Props to you! I’ve tried no poo several times and couldn’t ever get past 2 weeks… my hair just felt gross! I do however love my “homemade deodorant” (coconut oil, arrowroot power and baking soda) and my coconut oil moisturizer and hair “conditioner”. Make sure you update us on how it’s going! Uh oh, we will need to talk about your Valentine’s Day present that is on the way to you (should be there in a couple of days)……good luck with your hair! That’s awesome Monica! I may have to give it a go. I use natural deodorant and many other natural products, but still use the bad stuff on my hair. Well I will let you know how it goes. It might take up to a month or two before it gets back to normal. Congrats for giving no-poo a try! I’ve been poo-free for over 5 years now, and love it. The first month is pretty tough as your hair adjusts, but once it does – wow. My hair has never been healthier. These days, I just use baking soda perhaps 2 times a month, and the ACV once a week. Thanks for sending me this link….this helps me realize all the benefits to NO POOing.